RainSaucer - How do I remove Warps? How do I remove Warps? We like to think of it as a reboot which you should expect to perform a few times per season as part of normal maintenance. If the problem occurs more frequently, it means the winds in your area are regularly above the rating we have given for the product (30MPH) and you should consider an upgrade to our more wind stable 59" version (rated for 50MPH). An alternative to upgrading is to implement the 48" directly on to an open container such as a trash can (as we do with the 59") and running two perpendicular ropes from holes on one edge of the unit, under the container, to holes on the opposite edge on the RainSaucer. 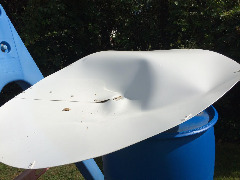 If you don't want to switch tanks or containers you could also host the 48" RainSaucer on a 5 gallon bucket instead and put the new implementation on top of your original tank. Then all one needs to do is make an overflow from the bucket to the tank.